Set sail on Norwegian Cruise Lines to discover “America’s Last Frontier”. Explore Alaska with an NCL cruise. Norwegian Cruise Line sets itself apart by attracting a younger cruiser demographic and promoting the more active tours available in Alaska. Sail through Alaska’s Inside Passage, home to wildlife both wooly and wet. Visit historic boomtowns and a touch of Victoria’s old England. Journey along Alaska’s inspiring coastline which reveals some of the wildest places on Earth including Glacier Bay and Juneau, roundtrip from Seattle. Aboard Alaska’s premium cruise line, experience awe-inspiring natural beauty, amazing wildlife and fascinating Alaska Native and frontier history. Cruises depart on Friday, Saturday, Sunday or Wednesday. HAL also operates extensive land tour options through Skagway you can explore land tours overnighting in Whitehorse then traveling through to Dawson City. From Fairbanks to Whitehorse and Beaver Creek to Skagway, Westmark Hotels are found in some of the most scenic destinations in the Land of the Midnight Sun. Roundtrip cruise from Seattle, the first day you are at sea. The second day the ship reaches it’s northernmost point through Glacier Bay. On day three turns southbound to explore the sight in Juneau, Alaska. Day four explore local culture more in Sitka, Alaska. Creek Street follows the next day when you embark in the small port town of Ketchikan and visit Butchart Gardens as you head to Victoria, British Columbia. On day seven you return to Seattle in the early morning. NEW for 2010, a 14-day itinerary cruises round trip from Seattle and combines eight ports of call, including the unique ports of Kodiak, Homer and Anchorage. It also includes two major glacier experiences: Hubbard Glacier and Glacier Bay National Park on most sailings. It departs every other Monday. Seven day Alaska cruise one-way between Vancouver and Seward (Anchorage). Discover College Fjord, Hubbard Glacier, Glacier Bay National Park and Canada’s Inside Passage. Shoreside see Ketchikan, Juneau, Haines (Skagway) and the spectacular Kenai Peninsula in Seward. Cruise the Inside Passage and Glacier Bay National Park and experience the Alaskan way of life in Juneau, Skagway and Ketchikan; a perfect blend of time on board and time ashore. What sets Celebrity apart from other vacation choices today is the cruise line’s passionate dedication to providing guests with a cruise experience that exceeds expectations. This extraordinary performance level has become the definition of Celebrity Cruises, and has set the worldwide standard for today’s expression of what first made cruising famous — high quality, superior design, spacious accommodations, grand style, attentive service and exceptional cuisine. The excellence of Celebrity’s existing cruise product continues with the cruise line’s Solstice-class ships, which embody even greater technical achievement and meaningful innovation, while retaining the distinctive style, sophistication and service elements that have become the hallmark of a Celebrity cruise. Celebrity Cruises was started in 1989, and has held true to its commitment of taking the best aspects of classic, elegant cruising and updating them to reflect current lifestyles. It merged with Royal Caribbean Cruises. Celebrity Cruises sets itself apart by always striving to provide a cruise experience that exceeds expectations – high quality, superior design, spacious accommodations, grand style, attentive service and exceptional cuisine. This cruise departs Seattle and is at sea for the second days as it embarks for Ketchikan, Alaska. After Ketchikan it cruises through the Tracy Arm Fjord on the fourth day until stopping at Juneau. After Juneau on day 5 the ship visits Skagway and in the evening departs to cruise the Alaska Inside Passage. Day 6 the Celebrity Infinity is at sea as it heads south towards the port of Victoria, British Columbia. On day 8 the final day of the cruise the ship arrives in Seattle, Washington in the early morning. The Ultimate Alaska Cruise departs from San Francisco, California. You’ll enjoy all the onboard amenities on the first two days at sea as the Celebrity Infinity makes it’s way northward. On the fourth day he first Alaskan port is Ketchikan followed by Juneau, then Skagway after which the ship is tendered overnight at Icy Strait Point. The following day the ship cruises to it’s northernmost destination Hubbard Glacier. The next day the ship heads back south to Sitka. The next day enjoy a day at sea as the ship heads towards back to Victoria on the following day. After Victoria the final destination is Vancouver where it arrives in the early morning. This cruise departs on the Celebrity Millenium from Vancouver, British Columbia. It takes the Inside Passage the and reaches Ketchikan the next day. The following day it is cruises northward through Icy Strait Point (tendered overnight) and reaches Juneau after Juneau the next day enjoy the Gold Rush town of Skagway. Day 7 is comprised of cruising to Hubbard Glacier. 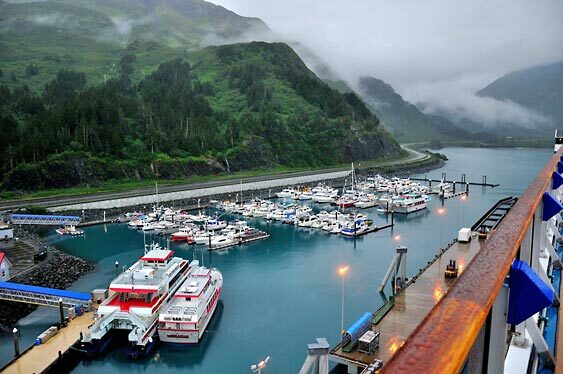 The final destination is Seward, Alaska. The southbound Alaskan Cruise is the reverse of the Northbound Cruise, it starts in Seward and travels the same itinerary back down towards Vancouver, British Columbia. This roundtrip cruise departs Vancouver and makes it’s way northward through the Inside Passage towards Icy Strait Point (where it is tendered overnight) followed by the impressive Hubbard Glacier. The next day explore the sights in Juneau (only accessible by air or water). After Juneau see the unique town of Ketchikan. The Mercury cruises back through the Inside Passage to reach the starting point the next day, Vancouver. As you can see Celebrity cruises offers a diverse selection of itineraries featuring northbound, southbound, return trips and extended cruises. They also offer landtours and many add-on tours. Carnival Corporation & plc is a global cruise company and one of the largest vacation companies in the world. Our portfolio of leading cruise brands includes Carnival Cruise Lines, Holland America Line, Princess Cruises and Seabourn Cruise Line in North America; P&O Cruises, Cunard Line and Ocean Village in the United Kingdom; AIDA in Germany; Costa Cruises in southern Europe; Iberocruceros in Spain; and P&O Cruises in Australia. Carnival is a global cruise company and one of the largest vacation companies in the world. Carnival operates several cruise line brands including Carnival Cruise Lines, Holland America Line, Princess Cruises and Seabourn Cruise Line in North America. Departing from Vancouver, Canada, the Northbound Alaska itinerary is packed with the best this untamed frontier has to offer. Sail along 67 miles of magnificent scenery in the Lynn Canal, and see the 16 Glaciers the comprise College Fjord in Prince William Sound. You can even choose to explore these glaciers by helicopter for an unforgettable experience of a life time. Get a taste of the Gold Rush in Skagway and Juneau, a sense of Russia in Sitka and spend a whole day in Glacier Bay. With Carnival Cruise Lines, you’re guaranteed to make the most of your time in Alaska. Taking a Northbound Alaska Cruise allows you to see Alaska from all angles. Sailing from Whittier (Anchorage), the Southbound Alaska Cruise itinerary is filled with the best the Last Frontier has to offer. Cruise along side 67 miles of spectacular scenery in the Lynn Canal, and see the 16 Glaciers that make up College Fjord in Prince William Sound. Catch Gold Fever in Skagway and Juneau, and experience the Russia-of-old at Sitka. Plus, you’ll get to spend a whole day exploring Glacier Bay. Carnival Cruises make sure you get the most out of your Alaska cruise vacation, during both the travel to the Alaska destinations and the upon arrival of each Alaska port. Experience Southbound Alaska “Fun Ship” style with Carnival Cruises. A destination eons in the making, Glacier Bay’s pristine landscape makes the top spot on most travelers must-see list. Your Glacier Bay Alaska cruise takes you to this protected national park that is spread across 3.2 million acres in Southeast Alaska and home to 15 active glaciers, numerous seabirds, otters, humpback whales and countless sights. And a Carnival Alaska cruise is the best way to make the most of your time here. Carnival Cruise Lines has one ship deployed to Alaska. The Carnival Spirit, the namesake vessel in the line’s popular Spirit-class, offers a diversity of resort-style facilities and features, including expansive spa and children’s facilities, four swimming pools, a cascading water slide, a wedding chapel and an Internet café. Most of her staterooms have ocean views, and of those, the majority have balconies. The delicious dining, wide variety of onboard activities and endless entertainment options on Carnival Spirit gives credit to their Fun Ship marketing.